Full Flow Swivel Radius Port hose ends allow you to plumb regulators, fuel pumps and dry sump with a minimum of fittings and connections. Designed for use with straight port threads, these ends eliminate the secondary adapter previously required. 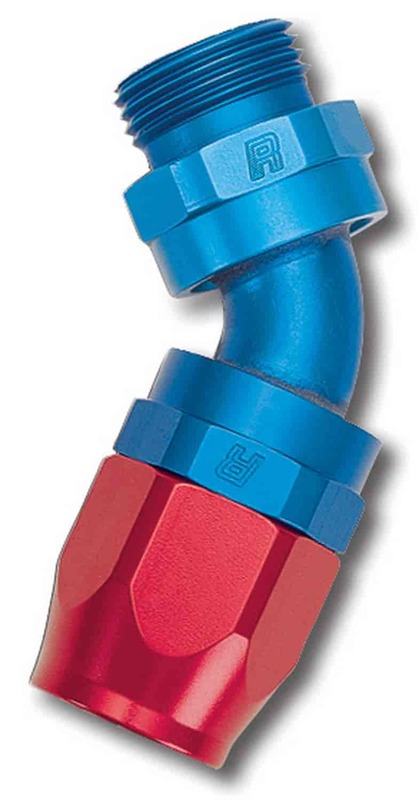 The hose ends attach directly to the component utilizing an o-ring for a positive seal. The radius end and thread length desing allow full engagement with out blocking the port for unrestricted flow. Available in 45-degree and 90-degree for flexibility in your routing, complete with Viton o-ring.